For the past 48 hours, you’ve been hearing one story on repeat. It involves “helpless” and “downtrodden” migrants storming the U.S.-Mexico border only to be met with tear gas by U.S. authorities. However, you should know that the media is intentionally omitting the reason that Border Patrol agents deployed tear gas, and the truth of the matter is downright disturbing. 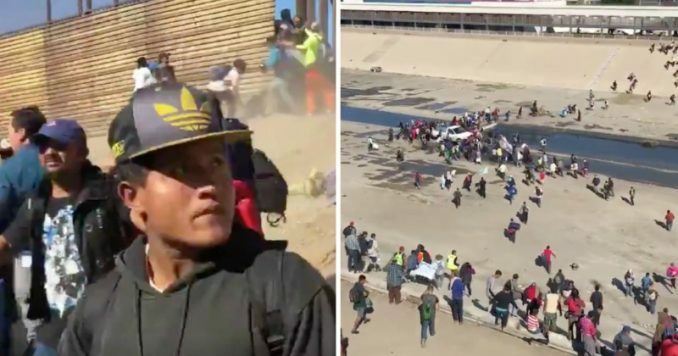 On Sunday, hundreds of Central American migrants currently staying in Tijuana stormed the U.S. border hoping to enter the country illegally. When they became violent, the Border Patrol deployed tear gas to stave them off, but that’s a very different reality than the one you’ve been hearing from the liberal media. The U.S. Customs and Border Protection in San Diego, California announced on Sunday morning that the San Ysidro port of entry going both northbound and southbound had been closed due to multiple planned demonstrations on both sides of the border. Additional personnel and resources were also deployed to the port of entry, and it’s a good thing, considering what unfolded the very same day. Roughly 5,000 migrants were camped out in Tijuana as of this weekend hoping to enter the U.S. one way or another. On Sunday, they apparently got tired of waiting to do so legally. Hundreds pushed past Mexican riot police and rushed toward the U.S. border in an attempt to infiltrate the United States. Hundreds of migrants approaching the U.S. border from Mexico were enveloped with tear gas Sunday after several tried to make it past fencing and wire separating the two countries. Earlier in the morning, a group of Central Americans staged a peaceful march to appeal for the U.S. to speed up the asylum claims process, but their demonstration devolved as they neared the crossing with the U.S. and some saw an opportunity to breach the border. But that’s not all the migrants did. They also threw rocks and other projectiles at Border Patrol Agents, several of whom were struck. With hundreds of violent migrants facing off against a handful of U.S. agents, authorities were left with no choice but to deploy the tear gas, which is a safe and effective deterrent. With no shortage of fake news stories floating around about what unfolded at the border over the weekend, it is important that we put things into perspective. The migrants seeking to enter our country illegally are mostly young men — not the “women and children” you’ve been told about — and they are endangering the safety of U.S. authorities. They should be dealt with forcefully.